- Buy a contract (i.e., bid for a contract) at the ask. - Sell a contract (i.e., ask someone to buy a contract from you) at the bid. - If selling, the bid: to sell a contract, place an ask that is higher than the bid. - If buying, the ask: to buy a contract, place a bid that is lower than the ask. Days left until the expiration of the option. The contract expires at the end of the 0th day until expiration. The number of options contracts one is seeking to buy or sell. The current value of the option at a particular strike price. 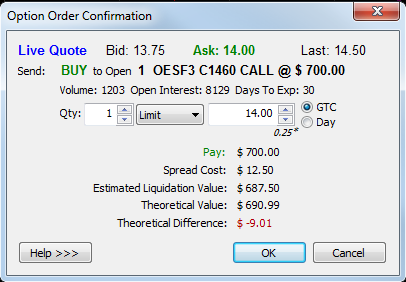 When placing an options order, this is a modifiable value. This value changes according to its minimum move. A limit/premium value further away from the current bid/ask/last is less likely to be touched in the short term. A Day option order is canceled at the current trading session’s market close if it has not yet been executed in the market. The limit/premium of an option can change by certain increments. The amount of this increment is the premium minimum move. If the option is on the buy side, then it will cost you money to acquire it. If the option is on the sell side, then you will collect an amount of money if it is acquired. The difference between the bid and the ask is called the spread. The current value. Closing the option at the current value yields the liquidate value. The price of the option. Premium * quantity * 1 full point value of the underlying futures contract. The calculated value of the option based on an options pricing model. The number of transactions that have occurred for the given option symbol today. The total number of options that are not closed or executed. - OAUD is the symbol base, where AUD is the underlying symbol. - V2 is the symbol for the month and year. - C100 is the strike quote, a call at 100.